Dinghy sailing trophies handmade for any sailing classs. 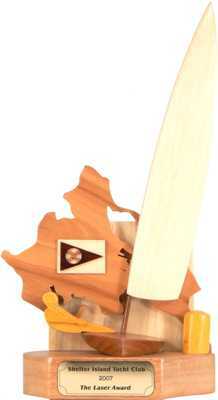 A complete list of all the dinghy class trophies we have made is at the bottom of the page. But don’t worry if you can’t see your sailing class. 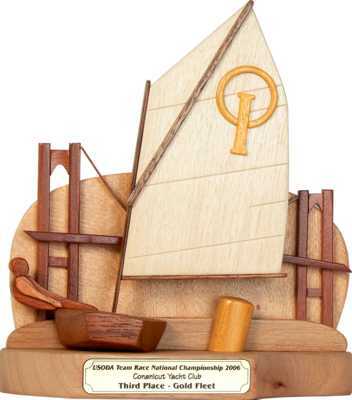 We can make trophies for any boat, including the one you sail. 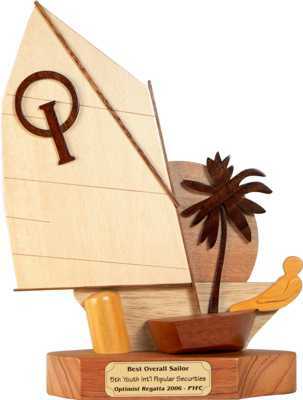 The perfect trophy for that tropical Optimist sailing regatta. Your boats displayed in front of a map of your choice. Here is a Laser in front of Shelter Island, NY. These Laser sailing trophies were made for a regatta held at Shelter Island, New York. The club burgee is also featured in the trophy. 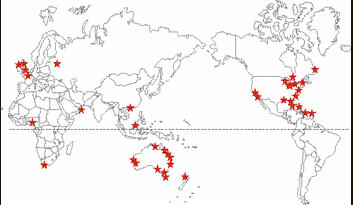 Include a local landmark as part of your unique trophy. This Opti is in front of the Newport Bridge. Sailing at Conanicut Yacht Club with the Newport Rhode Island Bridge in the background.